Abdulla Mohamed Almulla, chairman of the Dubai-based company, Almulla Hospitality, has plans to invest US$2 billion in as many as 90 hotels operating under a Shar'i supervisory board that will follow Islamic laws in banning alcohol and serving only halal food. Oddly, they will be marketed under brand names such as Cliftonwood and Wings (as well as the more Middle Eastern-sounding Adham), with initial operations in Saudi Arabia, the United Arab Emirates, Jordan, Egypt, Malaysia and Thailand, and Europe to follow. In addition, Almulla notes, the hotels "will appeal to non-Muslims as well because of their socially responsible culture. Hospitality is an integral part of Islamic culture and our hotels will provide a unique service not only for the Muslim community but for those of other religions and cultural backgrounds." (1) Almulla says that "The Islamic hotel chain is the new wave coming through," and that makes sense to me – it looks like a very sound investment. But Almulla also makes clear that the chain has a secondary function of da'wa, namely, to serve as a conduit of Shari'a to non-Muslims. (2) It is striking to note how many vehicles for the Shari'a to reach non-Muslims already exist, from the media to schools, and how many more are coming into existence. Apr. 11, 2008 update: The UK's first Islamic pub, the Halal Inn, opened last December in Oldham and is doing satisfactory business, reports its owner. 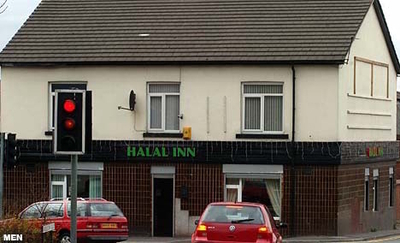 The Halal Inn, formerly known as The Westwood, in Oldham, UK. Dec. 14, 2014 update: Seven years after the Halal Inn got started and almost as long after the ambitious Almulla chain was announced, a quick search suggests that the former is defunct and the latter never got off the ground except for a minor property or two.